Devon engineering students are at the forefront of the latest football craze sweeping the country. The first UK Robot Football Championship is taking place on 5 and 6 April at Warwick University. 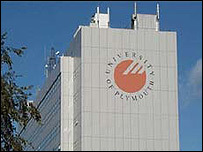 Plymouth University will be taking on a team from the Midlands university in the event. Plymouth students have been building the robots for the past 10 years and are heavily involved in producing such cutting edge technology. The event will mean split loyalties for Tim Harding, from Sampford Peverell near Tiverton in Devon, who is a fourth-year student at Warwick and has helped design and build the footballing robots. 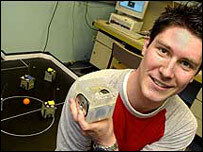 "Plymouth have been building these robots for the past 10 years," he said, "so really they are well ahead of the game. "I know I come from Devon but I shall have to be cheering on my own squad on the day!" The 'players' are basically super-intelligent boxes on wheels that can recognise a colour and pack a good kick. The pitch marks and rulings correspond pretty closely to conventional football. Tim and his colleagues at Warwick have produced their team of robots from scratch, with each of them costing about £100 to make. "There's very little human intervention once the match starts," said Tim. "The pitch is monitored by three cameras attached to a computer which decides all the players' moves. The only thing a human needs to do is to press stop or start on the keyboard." There is, however, a human referee whose job it is to time the two five-minute halves and watch for fouls, fixed cable connections and owners' intervention during the match. The robots must be fully autonomous, with all the powering on board. And while it sounds like a lot of fun, there is actually an educational purpose to the Championships too. "Robot Soccer is an entertaining way of promoting artificial intelligence (AI) in robots," Tim said. "We're already seeing similar robots in domestic use, like lawn mowers that sense the edge of the grass and vacuum cleaners which you just switch on and leave to their own devices to clean right up to the edge of the carpets. "This is just a fun way of demonstrating progress in the field of AI." Shortly after the National Championships have been staged, the teams will be taking part in the European Championships in Munich in June 2004. Eleven countries, including the UK, France, Germany, Italy and Spain, will take part. And at the 2004 FIRA Robot World Cup in Korea, more than 110 robot soccer teams from 23 countries will compete.